← What a Cute (and Destructive) Puppy! Film some crochet videos and start a YouTube channel. I’ve been wanting to do this for quite some time, but never seem to make it a priority, so I haven’t even started on this goal. But I hope that 2016 will be different and that I’ll take the plunge into filming some crochet videos for others to enjoy and learn from to help increase crochet knowledge and skills throughout the world! I love to share my crochet knowledge with others and to encourage them, so this is a good way to do that (in addition to teaching classes in person)! Publish 12 new crochet/knitting patterns. This is a big goal for me because my track record on self-publishing patterns isn’t this high! I only published 9 patterns last year and 4 this year (this year was hard because of the loss of my brother, getting a new puppy and taking a 2 1/2 week trip to China to visit our son and DIL). But I’m aiming to make this goal a reality by taking good photos of these 12 projects this weekend so I’ll be one step closer to achieving this goal! I have at least 12 new crochet/knitting patterns that are almost done, so I should be able to meet this goal (and possibly exceed it). Blog weekly. Wow! This goal is also a big one for me because I have fallen short of this many times! But at least I get back up on the horse (or the blog) to try again! I will try a few different ways to schedule blogging into my life and see which one works best to stay on track with this one! Obviously blogging when I feel like it is NOT working! My emotions are way too fickle and I fall into slumps quite often! Start and run a Ravelry group. This one is actually already started/done! Yesterday, I started a group on Ravelry to discuss my crochet and/or knitting patterns (and crochet in general)! And I have some friends who have already joined! Woohoo!!! I’ve had this goal for at least a year and I decided to stop putting it off. In the words of Shia LaBeouf, “JUST DO IT”!!! If you’d like to join this Ravelry group to ask questions about my crochet/knit designs or to simply discuss crocheting, you can find the group here. 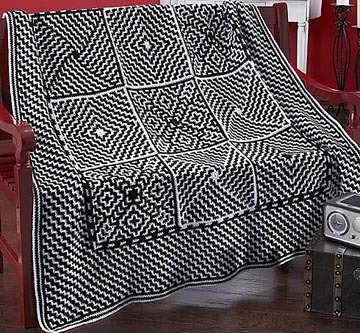 This afghan is called “Sudoku” and the pattern is found in a leaflet called “Herrschners 2014 National Afghan Contest Winners Crochet Afghans”. You can find that leaflet for sale on the Herrschners website here. They also sell a kit to make the afghan here. I don’t know if I’ll take the time to make the whole afghan, but I’d like to make a few of the squares to learn how to do mosaic crochet in the round instead of in rows! The square in the center of the afghan looks the most interesting to me! If you’re not familiar with Brioche knitting, it creates a thick knitted fabric that looks so intriguing! I have a book on Brioche knitting, as well as on the Twigg Stitch, which is Brioche knitting “on steroids”, as far as I’m concerned! Both of these knitting techniques should provide a good challenge, but I need to make sure that I’m having a good thinking day and not too many distractions to learn them (they seem intense to me as a fairly new knitter)! So there you have it! I may change some of these goals throughout the year and possibly add to them, but at least I have a “plan of action” to move forward instead of stagnating! What are some of YOUR crochet goals/resolutions for 2016? What new crochet and/or knitting techniques do YOU want to learn next year? 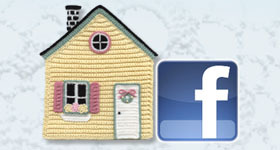 This entry was posted in Crochet technique, Knitting technique, Learning something new, Mosaic Crochet and tagged crochet techniques, knitting techniques, Mosaic Crochet. Bookmark the permalink. My goal for winter is to finish my crocheted snowflake afghan in two colors using fisherman’s wool. Then finish one knitted afghan, for a total of three afghans this winter. I need to get the afghans done before it is too hot to have them grow on my lap. After that, I can set new goals. One I know I want to include is your mosiac scarf. I already have the yarn. Thank you for sharing your goals, Susan. I’m looking forward to those youtube videos and more frequent news from you. LOVE that soduku afghan. Wow! Wow! Three afghans in one winter! That’s a huge accomplishment! I LOVE your first Snowflake Afghan and I look forward to seeing the other 2 afghans you complete. I really enjoy mosaic crochet (and knitting). 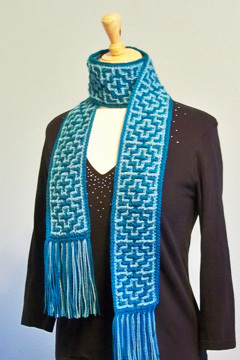 My mosaic scarves (crochet and knit) are quick projects that pack a lot of interest in them (unlike afghans)! I look forward to starting some crochet videos and getting a Youtube channel started next year! I’ll let all of my readers know when I have it going! That Sudoku afghan is fascinating. I might have to buy that book to learn the technique too. It’s a great technique! I made one of the squares in the book (most of the square) last week. It wasn’t hard to do, but the instructions were written a little differently. Once I figured out how they were written, it was easy to do! Finally! I’m in, but now I forgot what I was going to say! LOL! Hmm. I think my creative resolutions for 2016 would be 1. To learn Tunisian crochet, 2. Do more loom knitting, 3. Crochet a LOT of things to sell at craft fair(s) this summer, 4. Start making next year’s Christmas presents NOW! 5. To MAYBE make a knitted scarf (provided I can cast on and bind off!) 6. Get my craft room organized! I’m so glad that you finally got logged in to leave a comment! Those sounds like wonderful resolutions/goals! Thanks for sharing them with us!